BuzzinBumble: Three New Linky Parties! Following Lorna to the quilt shop! 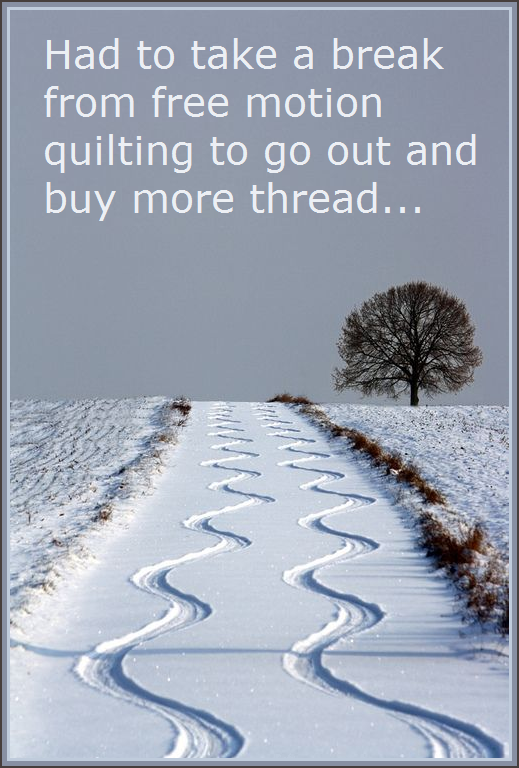 There's a new sheriff in town and ... well no, not really, but there are three new linky parties in Quilty Blogland that I think you all will enjoy. I'll start with Heidi's, since it is somewhat time sensitive. My talented friend Heidi, of Red Letter Quilts, was left feeling bereft when ALYoF (A Lovely Year of Finishes) ended. But she didn't stay sad for too long, because inspiration struck! 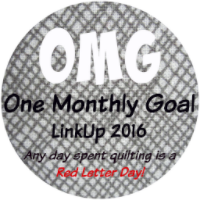 Heidi is kicking off a new linky party this week, called One Monthly Goal. Its aim is that people can set one quilt related goal at the start of each month, share it in the linky party during the first week of the month and cheer each other on. Then, during the last week of the month, return and share their accomplished goal. To top it off, Heidi is going to offer a chance to win a prize each month for those who link up both times. Doesn't that sound exciting and imminently do-able? I hope you hop over to Red Letter Quilts and join in the fun! This month is chock full of nuts eventful happenings for my family, with much activity centering around the arrival of our first grandchild, a baby girl named Eden. Our daughter Kaitie is ready to deliver any day now! Watching her tummy is like watching a large cat in a small bag! ...and yes, the whole room is like this. So this is my goal for January - to make a place for everything, to put things away neatly, and to destash, sell, or give away things that I no longer think I will use. I normally spend way too much time hopping around blogland, but this week I am going to buckle down and get 'er done! Hopefully, starting the year off well organized will make a big difference in my ability to accomplish other goals. If you have some ideas of how you want to manage your hoarding stash this year, or need a little inspiration, you will love checking out the amazing Jen's very practical The Year of the Stash Manifesto and Linky at a Quarter Inch From the Edge. Write your own stash manifesto and share it with everyone! The other new linky party I'd like to tell you about is being hosted by my charming friend France, of inspiration imagination creation. 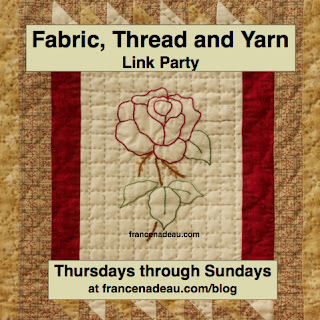 She has started a linky party called Fabric, Thread and Yarn. France's party runs Thursdays through Sundays and you can even link up old posts! Don't you just love when you can do that? I hope you all are having a beautiful start to the New Year! Thank Lara! I love linky parties, they give me so much inspiration. Lorna's signature quilting is hilarious!! Hope you get a chance to read that book before Eden arrives haha! Thank you so much for the Buzz Lara, and two more leads as well! Can't wait to hear that the baby has arrived - sending positive vibes for an easy delivery. Thanks for finding the linky parties for us. I need to organize this month also. I stuffed fabric etc.... into a cupboard when holiday company arrived and now I'm afraid to open it. Everything will probably just tumble out on top of me. Thanks for sharing those new link parties. Organizing can be a chore but it feels so good when it is done. Have fun! I think I better follow your lead and tidy my creative area before doing anything else. I also want to get rid of a few things. It feels like having too much actually stifles the desire to create. Your hidden book titled cracked me up!!! Yeah, it happens to all of us, right? Congratulations on the new grandbaby!!! Good luck on making your goal for OMG!! Thanks for the information. That's so funny about the book!! Thanks for the link up info. I'll definitely be linking up to the one goal. I've already linked up to the Stash link up. I'm cracking up at your picture with the great book in the pile. I just attacked the closet in my sewing room which was looking a lot like that pile. Now the rest of the room isin a mess and I'm going to have to clean it before I do anymore sewing. The closet looks great though. Oh I am sooooo belly laughing literally outloud right now! As soon as you zoomed in on that Tidy up book title I lost it!!!!! I wish I wish I wwere near...I LOVE tackling this kind of organizing.Oh and I'm so excited for you to become a grandma!! Keep us posted!! Thanks for sharing these linky parties. They all sound like fun, but I'm terrible at keeping up with these things (despite my best intentions!). How exciting to be waiting for the new baby! Babies are great inspiration for quilters! So much fun!!! You do have a wonderful and exciting year ahead. I can't wait to see the first pics of that little Eden. How fun to see a "little" peek in your quilting room and that book.....LOL....perfect! I don't know about you but I always enjoy reorganizing my room and think of all the things you will find. Have fun and soon you'll be enjoying a new little one! I had to laugh when you observed that the book does not work through osmosis - now I know why my copy has had no affect! A couple of those link ups sound interesting so I'm going ot check them out, Happy New Year and new baby! Thanks for the new link party info! I need to work on my sewing room also and need to borrow your book when Needled Mom is finished with it! (I see your swiffer duster in the stack also, hehe) Happy New Year! What a valuable - and funny - post! I'm so glad I read it to begin my day. I had to laugh at the irony of the book title. I can relate!!! I have a book called something like "It's In Here...Somewhere," but I can't find it at the moment! I read it before, but I don't think it stuck. I need to pull it out and read it again. Looking forward to Eden's arrival! She will guarantee you many smiles in 2016! I couldn't help but laugh when I saw the 'book' in the middle of the pile. It looks like it is actually helping. That is helping keep the pile from falling over. I need to address my own assortment(mess) before it becomes a disaster. Oh My Golly!!!! How funny you are!! I got such a good chuckle reading your post! Maybe you feel a bit "lighter" after publicly sharing your "creative piles" with us?! Thanks for the new linky's . You always find wonderful resources and blogs!! Can't wait for Eden to arrive!!! Hey, that looks like my sewing area too! No wonder I can't keep track of my scissors. Best wishes for a safe delivery of that grandbaby! Thank you for sharing these links, Lara...exciting times ahead for your family, best wishes for baby Eden. Bet you wish that book would work by osmosis!! Good luck with that goal too! Your space looks just like mine! Love the book in the middle of the pile.lol I'm off to check the links you posted. I already found Red Letter Quilts. Congratulations on the new grandbaby too. Thanks for making me laugh!!! I did some organizing the last couple of days but still have far to go!! Good luck and Happy New Year . Oh, I love a linky Party.....or two, or three! I will certainly check them out and add them to my Linky page so I don't forget about them. I kind of feel like I wrote your blog post today because it reflects my world so much as well...I have written down my blog resolutions and so far....so good!!! ps...I had to giggle a little when I read "discombobulated"...my dad used to love using big words to get my kids thinking....that was one of his favourites..."plethora" was another. hey, I joined the 100 day Challenge...but where are you? I had to laugh at the zoomed in photos! I've read that book and took away from it 1 place to store each type of item - the lady was not a quilter methinks! The first picture of your post is quite funny. Those prints look so much like her quilting. Did she see it? Making a post to generously talk about others' endeavours is so like you, Lara. What an honour to be the recipient! Thank you! 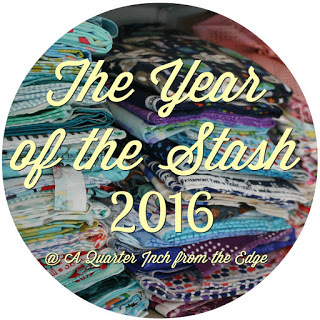 Thanks so much for spreading the word about The Year of The Stash! And I'm already on the One Monthly Goal bandwagon... I really needed a replacement for A Lovely Year of Finishes. In other news, my own copy of The Art of Tidying Up should be arriving any day. It seems to be sweeping the blogosphere (nothing like January to get people interested in organizing...) The blog Finding Joy is doing a special challenge related to it. Maybe you should check it out. Sending good thoughts your way for the arrival of that precious grandbaby! I read Tidying Up this past year. Many good ideas; not sure everything works for me but it ties in with my general feelings. What a great idea to get your room tidied up before sweet Erin arrives. Enjoy! congratulatuons on your new grandaughter !! how special :) have fun organising your sewing room it will be worth it !! A granddaughter, Lara! I'm so exited for you. Nothing brings joy like a new baby. Happy 2016. Hope you've made good progress on your sewing room re-organization. Hope to read more in a couple of weeks. Good luck. I have been talking to a couple of other bloggers about the state of my sewing room. I promised one of them that I would venture into that room and make some progress in there. Then I came to your blog and you had me laughing out loud. Clearing out that room is a great goal to have for the month, and I will join you in that challenge. Happy New Year! Oh my goodness! Congratulations on the impending arrival of your granddaughter! I did have to chuckle when we zoomed in on your stack in the sewing room. But that's okay. You will get a handle on that room in no time and be back to cradling, er I mean, creating in no time! I had not heard of these linky parties, thanks for sharing them! Good luck with the tidying up!!! And enjoy the surprises you will find! Wonderful linky party ideas! Thanks for sharing them with us, Lara! Good luck organizing. Before you know it, you will have it all sorted out. Most importantly though, have a lot of fun with Eden! Thanks so much for the new linky party information. I love linkies! I also love that you are willing to show your little corner that needs some tidying up since we all have them. When I get sewing away my sewing room gets crazy messy, and some times I have to take a day to get everything back into place. I can't wait to see what you are up to this year!